Gold prospecting isn’t exactly the most original of backdrops for an online slot. However, it’s probably no surprise - sun, gold, history, a chance to include a sun-baked old bloke with an over-the-top accent – yep, it’s no surprise, really. 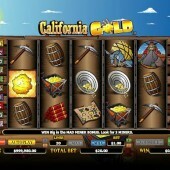 Online slot developer BetSoft Gaming, of course, came up with the oil digging-themed Black Gold, and closer to the gold rush theme there has been developer Microgaming’s Wild West-themed slot, Western Frontier. That’s not to say this 5 reel, 25 pay-line slot should be dismissed as it has plenty to offer the jaded slot fan. 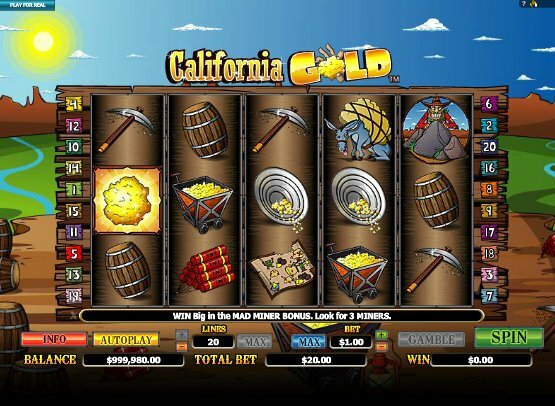 You can play California Gold for as little as $0.01, and the range is massive, making this a great slot for all manner of player. So far, so gold prospecting; but what about the graphics? Inevitably here we get treasure maps, a mine cart, panning dish, a mule who’s been worked just a little too hard, gold nuggets, lanterns, dynamite and pickaxes, along with our bearded miner friend. Three or more gold nuggets scatters anywhere on the reels triggers a free spins bonus where all wins are trebled. Meanwhile, the crazy prospecting miner acts, appropriately enough, as the Wild, and he appears on reels 2, 3 and 4. Get three of these crazy critters and you’ll trigger the ‘Mad Miner’ bonus. Here you’ll get the ‘Pick a Box’ game, common in many different slots, where you have to prospect in the correct mine. Pick right and you can bag some serious bonus wins as our miner goes off on an animated jaunt through the shafts grabbing at nuggets which carry different prizes. Manic Miner was a classic of the computer games era, and online slot developer NextGen Gaming’s own ‘manic miner’ features in a perfectly acceptable online slot. If not a complete classic it has enough frantic action to while away a bit of your time.